Round trip transfers to and from the Resort. The scuba in Belize is among the best in the world. 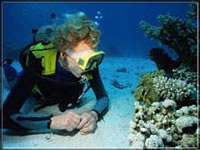 The water is warm and calm, the tropical ocean life is varied and plentiful, and visibility is outstanding. The nineteen miles of living tropical reef offers something for everyone, from the Beginner to the most experienced Technical Diver. Ambergris Caye, a beautiful Caribbean island of white-sanded beaches and clear turquoise waters, make it the perfect place for the perfect relaxing vacations. Sundiver Beach is the perfect resort to spend your Belize vacation!